This is because smart phones running on Android system dominate the mobile device population. This does not necessarily means that Android phones are more prone to attack than those running on Windows and iOS. Samsung Galaxy S4. 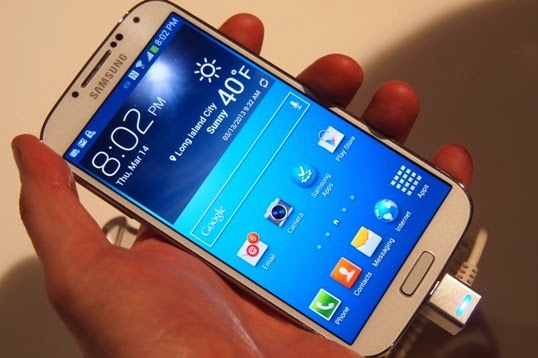 Samsung smartphones and tabs are running on Android operating system. Android smart phones are the world's most malware-infected mobile devices with 60% of them globally having been successfully targeted by malicious software in the last quarter of (Q4) 2013. This was according to the Kindsight Security Labs Malware Report-Q4 2013 whose findings have been made available recently. The report by the malware detection arm of the Ontario-based network security solutions provider said the figures regarding infected devices was conservative. It explained that this was because detectors of Alcatel-Lucent-Kindsight's parent company-were not employed in China and Russia where infection rates are known to be higher. The report attributed the 60% infection rate to the fact that Android devices hold the largest share of the global market for smartphones. It explained cybercriminals often go after low hanging fruit to maximise results from their efforts. It likewise said 40% of infected devices were Windows PCs connected to the mobile network. On the other hand, iPhone, Blackberry, Symbian and Windows Mobile accounted for less than one percent of infected mobile devices. Unlike the iPhone or Blackberry, the Android offers the ability to load them from third party app sites. TheGreenMechanics: International Telecommunications Union estimated that there are 2.1 billion smartphones globally. If you are in the higher risk bracket, just play safe and be very careful with what you download into your phone.